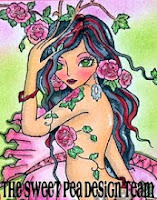 Welcome to Sweet Pea Stamps (SPS) “Artist of the Week.” Our artist this week is Rachel Anderson. I love Ms. Anderson’s fantastical images. I chose to create with “Forget-Me-Not.” You can find her images in digitalformat or rubber stamp format on Plate #173, whichever you prefer for your little pieces of art. I kept “Forget-Me-Not” very simple. I used Copics in blues and greens and added some Spicas in blue and green. I did some highlighting with a white gel pen. I also thought that the little forget-me-nots needed some centers, so I dug up my gold acrylic paint and a detail brush and went to town making little gold dots. 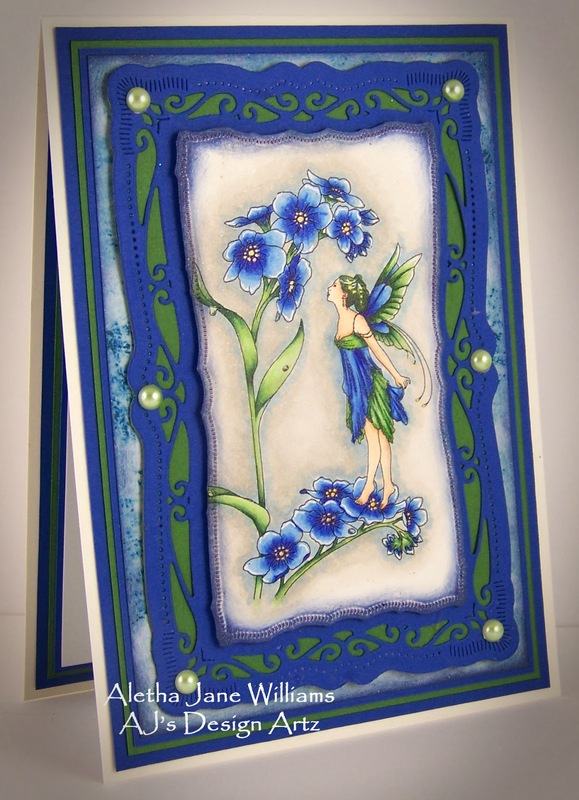 The cardstock is Stampin’Up’s Brilliant Blue and Garden Green layered with Tim Holtz’s Ideology Vintage Shabby. I finally got the courage to use my new Spellbinder’s Radiant Rectangles die. They were rather intimidating to me, but once I got started playing it was fairly easy. I did use wax paper between the die and my cardstock. This helped with the removal of those intricate cuts. The last item was some flat-backed light green pearls from my stash. I hope that you can play in Sweet Pea’s challenge at One Sweet Challenge. If you do enter, and you use an SPS image, please share your creations with us in our SPS Facebook group. To keep up on all the happenings at SPS, take a visit to our SPS Facebook page. Thanks for your visit today. 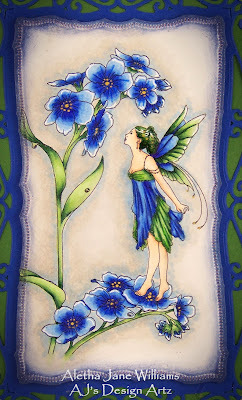 I hope you stop by our SPS blog every day for some Sweet Pea inspiration. If you have any questions, don’t hesitate contacting me. 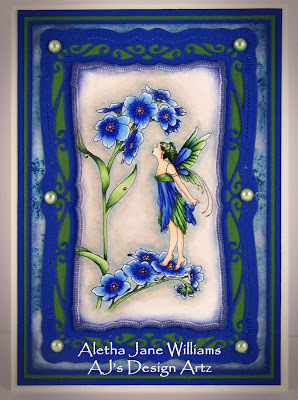 Hello Miss Aletha, this card is just GORGEOUS, I love the 4 layers behind the frame is fabulous then the images colored to perfection, the should have a gorgeous, in the reflection, so I could click it instead :O), thanks for sharing, boy you make the world a more beautiful one with your art work... Have a wonderful week..
Hi, Aletha! Congratulations on your new team! This is stunning, stunning, stunning! Please blow some of your talent my way! :D) You are one talented lady! You are an artist! I love the blues and greens.